Amenemhat I, also Amenemhet I and the hellenized form Ammenemes, was the first ruler of the Twelfth Dynasty, the dynasty considered to be the golden-age of the Middle Kingdom of Egypt. He ruled from 1991 BC to 1962 BC (1939 BC to 1910 BC). Amenemhat I was probably the same as the vizier named Amenemhat who led an expedition to Wadi Hammamat under his predecessor Mentuhotep IV, and possibly overthrew him from power. Scholars differ as to whether Mentuhotep IV was killed by Amenemhat I, but there is no independent evidence to suggest this and there may even have been a period of co-regency between their reigns. Amenemhet I was not of royal lineage, and the composition of some literary works (the Prophecy of Neferti, the Instructions of Amenemhat) and, in architecture, the reversion to the pyramid-style complexes of the 6th dynasty rulers are often considered to have been attempts at legitimizing his rule. Amenemhat I moved the capital from Thebes to Itjtawy and was buried in el-Lisht. There's some evidence that the early reign of Amenemhat I was beset with political turmoil, as indicated by the inscriptions of Nehri, a local governor. There were some naval battles where an associate of Amenemhat I by the name of Khnumhotep I was involved, and helped to procure victory. Later, Khnumhotep was appointed as an important local governor at Beni Hasan, and he founded a dynasty of local governors there. His grandson was Khnumhotep III. In the inscriptions by Khnumhotep, mention is also made of military campaigns against the Asiatics and the Nubians. Amenemhat I's name is associated with one of only two sebayt or ethical "teachings" attributed to Egyptian monarchs, entitled the Instructions of Amenemhat, though it is generally thought today that it was composed by a scribe at the behest of the king. 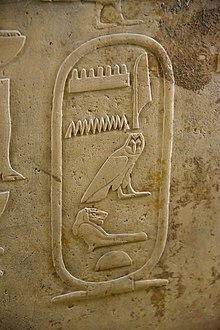 Amenemhat I's Horus name, Wehemmesu, which means renaissance or rebirth, is an allusion to the Old Kingdom period, whose cultural icons and models (such as pyramidal tombs and Old Kingdom artistic motifs) were emulated by the Twelfth Dynasty kings after the end of the First Intermediate Period. The cult of the king was also promoted during this period, which witnessed a steady return to a more centralized government. The vizier at the beginning of the reign was Ipi, at the end of the reign Intefiqer was in charge. Two treasurers can be placed under this king: another Ipi and Rehuerdjersen. Two high stewards, Meketre and Sobeknakht, have also been identified. His pyramid was made in the same fashion as 5th and 6th dynasty pyramids by having a rough core clad with a fine mantle of smooth limestone. "The core of the pyramid was made up of small rough blocks of limestone with a loose fill of sand, debris and mudbrick. Perhaps the most remarkable feature is that it included fragments of relief-decorated blocks from Old Kingdom monuments – many from pyramid causeways and temples, including Khufu's. Granite blocks from Khafre's complex went into the lining and blocking of Amenemhat I's descending passage. We can only conclude that they were picked up at Saqqara and Giza and brought to Lisht to be incorporated into the pyramid for their spiritual efficacy". When the limestone outer layer was taken, the core slumped. The pyramid and temple have been used as a source of material for lime burners so only a small amount remains today. The Middle Kingdom pyramids were built closer to the Nile and Amenemhet I's burial chamber is now underwater because the River Nile has shifted course. The complex has an inner wall of limestone and an outer wall of mudbrick; members of the Royal family were buried between these two walls. There are a number of mastaba tombs between the walls and 22 burial shafts on the western side of the pyramid. His son Senusret I followed in his footsteps, building his pyramid – a closer reflection of the 6th dynasty pyramids than that of Amenemhat I – at Lisht as well, but his grandson, Amenemhat II, broke with this tradition. “ Year 30, third month of the Inundation season, day 7, the god mounted to his horizon, the King of Upper and Lower Egypt Sehetepibre went aloft to heaven and became united with the sun's disk, the limb of the god being merged in him who made him; whilst the Residence was hushed, hearts were in mourning, the Great Gates were closed, the courtiers crouched, head on lap, and the nobles grieved. Amenemhat I is considered to be the first king of Egypt to have had a coregency with his son, Senusret I. A double dated stela from Abydos and now in the Cairo Museum (CG 20516) is dated to the Year 30 of Amenemhat I and to the Year 10 of Senusret I, which establishes that Senusret was made co-regent in Amenemhat's Year 20. Naguib Mahfouz, the Nobel Prize-winning Egyptian writer, includes Amenemhat I in one of his stories published in 1941 entitled "Awdat Sinuhi". The story appeared in an English translation by Raymond Stock in 2003 as "The Return of Sinuhe" in the collection of Mahfouz's short stories entitled Voices from the Other World. The story is based directly on the "Story of Sinuhe", although adding details of a lovers' triangle romance involving Amenemhat I and Sinuhe that does not appear in the original. Mahfouz also includes the pharaoh in his account of Egypt's rulers "Facing the Throne". In this work, the Nobel laureate has the Ancient Egyptian gods judge the country's rulers from Pharaoh Mena to President Anwar Sadat. Wikimedia Commons has media related to Amenemhat I. ^ Erik Hornung; Rolf Krauss; David A Warburton, eds. (2006). Ancient Egyptian chronology. Brill. ISBN 9004113851. OCLC 901251009. ^ "Egypt: Amenemhat I, 1st King of the 12th Dynasty". www.touregypt.net. Retrieved 10 April 2018. Mahfouz, Naguib. The Return of Sinuhe in Voices from the Other World (translated by Robert Stock), Random House, 2003.